Treatment of whistleblowers by the UK government has been questioned after recent revelations by a British weapons engineer. The whistleblower went absent after going public with his report on lack of nuclear safety, but says he will surrender on Monday. 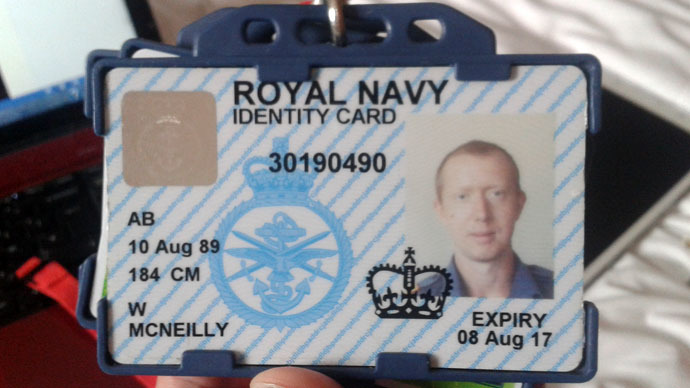 William McNeilly, a former Navy officer, went on the run after co-operating with WikiLeaks to post a detailed 18-page report exposing alleged security lapses in the UK’s trident nuclear program. With both the Royal Navy and the police trying to track him down, the whistleblower said he would be handing himself into the police on Monday. "There’s nothing I can do from prison; whatever happens now is up to you and the government," the man wrote on Facebook under the name William Lewis. Adding that he has been moving between countries, changing his location “almost every day,” the whistleblower said he now "lacks the resources to remain undetected." Both experts and the public are now worried about the fate of the man whose bomb-shell report has not only given rise to concerns over the country's security, but also questioned the authorities' attitude towards public service whistleblowers in the UK. "[If he does hand himself in] I have no doubt he will be questioned by the Ministry of Defense and disciplinary proceedings will be taken," Rob Edwards, environmental journalist for the Sunday Herald told RT, adding that a petition has been launched in the UK calling for McNeilly's pardon. Pointing to a disconnect between official government rhetoric encouraging people to speak out, and what actually happens in practice when a whistle is blown, a former MI5 agent and whistleblower Annie Machon told RT that "the UK government treats whistleblowers appallingly." "Whistleblowers are the regulators of last resort, when every other form of accountability and oversights and justice has failed, we need these brave people to come forward," she told RT, adding that "whistleblowing is quite an established culture in the UK." Over the years, a number of stories have surfaced about public servants being bullied or sacked for wanting to raise an alarm or highlight wrongdoings. People from both the National Health Service (NHS) and Metropolitan Police Service (MPS) have suffered after exposing ugly truths within their departments. Less than a year ago, the Public Accounts Committee released a report saying the treatment of public service whistleblowers was “shocking.”“The abusive treatment and rampant victimizations of whistleblowers has created a climate in which large segments of defense and health workers would be afraid to report departmental malfeasance,” it stated. The government has also controversially changed the law for civil servants, forbidding them to speak to the press without prior governmental approval, in a move union leaders call a direct threat to whistleblowers. As a result, some British newspapers have set up a secure service where would-be whistleblowers can leak their information without fear of retribution. "But if you are coming out of a military or intelligence agencies, you face not only the ruin of your reputation, the loss of your career and the loss of your friends and livelihood, you also potentially or probably face imprisonment too for the breach of 1989 official secrets act," Annie Machon told RT. William McNeilly’s disclosures might fall under this law, as it makes it a crime for anyone coming out of defense or intelligence to report incompetence on the part of their employers. If the whistleblower is prosecuted under this act, he faces up to two years in prison.